Strong Northerlies, and blizzard conditions in the Cairngorms and Northern Highlands, pointed to a venue somewhere in the Southern Highlands, last week (November 29). I suggested to Roger Webb, who is always keen to climb off the beaten track, that a visit to Beinn Heasgairnich may be worthwhile. The cliffs in its northern corrie are relatively compact, and over the last ten years they have been thoroughly explored by George Allan, John Thomas and Billy Hood. They have climbed all the major features resulting in a series of classic gully and buttress routes. Sophie Grace Chappell and I made a visit a couple of winters ago, but despite this focused attention, a direct line through the steepest part of the cliff was still unclimbed. The corrie is one of the most secluded in the Southern Highlands and is invisible from most viewpoints. To add to its mystique it is not described in any guidebooks and is not marked on the OS map. Icy roads meant that despite an early start we were not climbing until midday. Fortunately, the first two pitches went quickly, leaving Roger the job of making a bottomless traverse on dwindling turf to reach the crucial steep hanging groove cutting through the headwall. The situation was spectacular, but the mica schist was particularly unhelpful, and protection was almost non-existent. 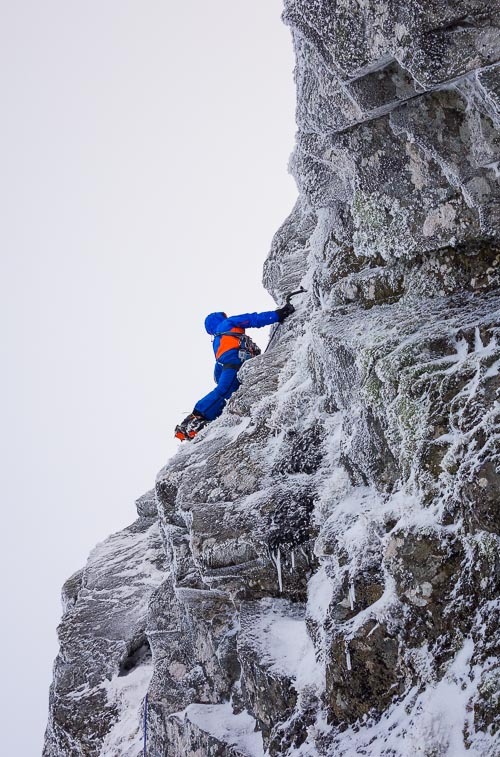 He placed two runners in the 40m pitch, but fortunately the turf was frozen to winter climbing perfection. A short final pitch saw me on the top just before a snowstorm sent us scurrying back down as night fell. In keeping with the lion theme of adjacent routes, we called our climb Androcles and graded it V,5. This entry was posted in New Routes and tagged Beinn Heasgairnich, Roger Webb, Simon Richardson. Bookmark the permalink. Hi Simon, despite this apparently being a munro (thanks Google) I can’t say I have ever heard of it. Is there a topo or list of climbs anywhere? Also, whats the walk-in distance?